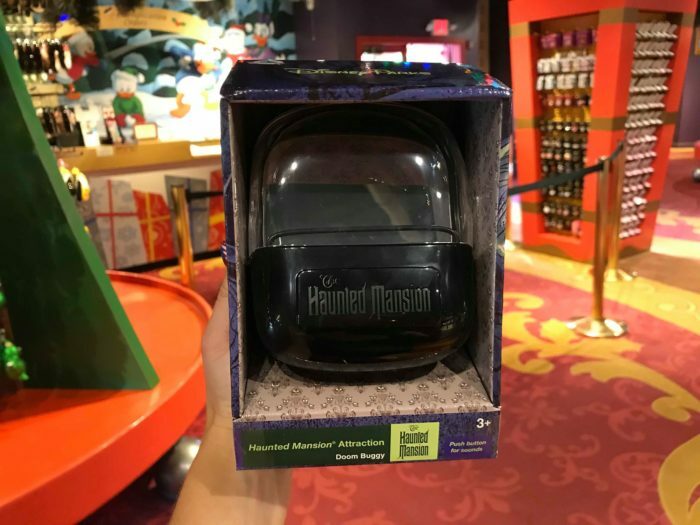 Look alive ghosts and ghouls, it looks like brand new Haunted Mansion Annual Passholder Merchandise has started to haunt Walt Disney World. The spooktacular new items have materialized at the Emporium in the Magic Kingdom. The haunting collection has two new shirts, and a decorative tray. The infamous Hat Box Ghost graces the front of a new unisex tee available for passholders. His bold top hat has “PASSHOLDER” written across, while an eerie roses intertwine with a Haunted Mansion banner. This is a grey tee that has a relaxed feel to it. You can keep it as cool as the beloved Haunted Mansion with the faded black tank top. This top features a gorgeous bat shaped design, filled with beloved characters and icons from the attraction. Beneath the incredible bat design the shirt reads “The Haunted Mansion Passholder”. This tank top has a distressed look to it for an effortless look. Lastly, we have the stunning Haunted Mansion Tray! This tray features the same beautiful bat design as the passholder tank top. It’s a very nice and sturdy piece, and you can really see all of the details that have been woven into this unique bat design. The tray also has a handle on each side. You can get this boo-tiful new tray for $39.99. You can find the delightfully ghostly Haunted Mansion Annual Passholder Merchandise at the Emporium on Main Street U.S.A. in the Magic Kingdom now.